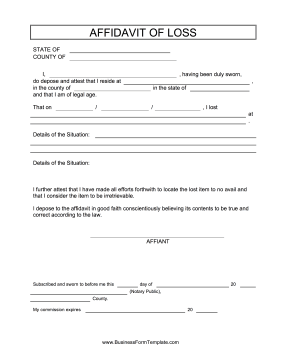 This free, printable affidavit of loss can be used by public notaries and victims of theft and fraud. I, ____________________, having been duly sworn, do depose and attest that I reside at ____________________, in the county of ____________________ in the state of ____________________ and that I am of legal age. That on ____________________, I lost ____________________ at ____________________. I further attest that I have made all efforts forthwith to locate the lost item to no avail and that I consider the item to be irretrievable. I depose to the affidavit in good faith conscientiously believing its contents to be true and correct according to the law.